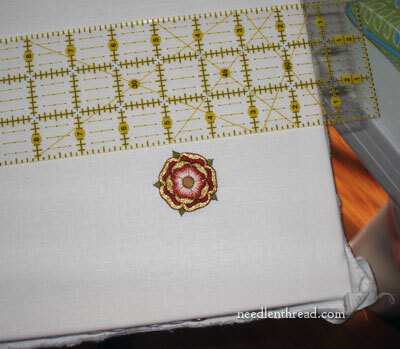 Tudor Rose in Silk & Gold – Finis! I’m satisfied with the result. There’s a little burble of a problem on it, but it’s not too easy to see. I’ll be more careful about the join on the stretched pearl purl around the center area the next time. It was a somewhat sloppy join, but the solution for it, after pinching and prodding with tweezers and mellore until I was angry, the threads were angry, and a virtual shouting match was going on in my head between the threads and me, was to take it out. And at that point, I figured it wasn’t All That Bad of a Join. I can live with it. I’ll show you how I worked this little project step-by-step in the near-ish future. I will admit it was not an easy element to do. Sure, the stitching concepts are really not that hard – you’re looking at satin stitch, long and short stitch, couching, and stem stitch. That’s it. But because the piece is very small, and because accuracy is required for a decent outcome, it was a somewhat intense little project. Just for the fun of it, another scale shot. The outer ring of red petals is too small for successful shading with the thread I was using, so they had to be a solid color. I could have mimicked shading by adding a line of stem stitch along the gold inside edge (at the outermost extreme of the colored part of the outside petal), but if I did that, the color choice for the outside petal would have to be the “medium” tone, which is pink. I contemplated this path. I contemplated the pink. I stitched a small sample petal with the pink. So the outside petals being red, the next followed the choice to shade the inside petals from dark on the outside to light in the middle. This could have been reversed, but I wanted the gold to always come in contact with red, because the contrast is more striking. The gold in contact with the pink was somewhat soft. In contrast with the red, it became rich and bold. Concerning the minimal use of pink in the blend between the red and the cream center in the long and short stitch section, what I considered was carrying the color change as quickly as possible to the contrasting extremes. There is no room inside the petals for a lot of gradual shading. So the pink is there just to form a minimal transition between the red and the cream. 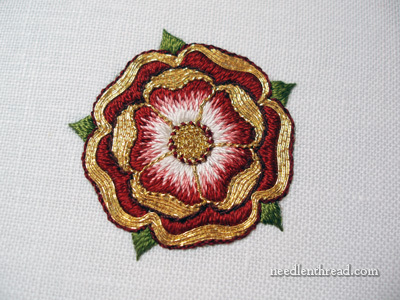 That’s what my color choices and arrangements were based on, but if you’re keen to stitch this Tudor rose and follow along with the tutorial once I get it up (! ), you can choose and arrange your colors differently, to produce a variety of different effects. 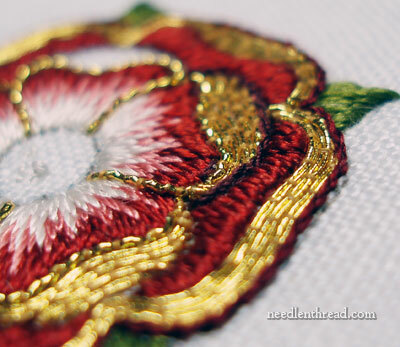 Up later this week, I’ll give you the Tudor rose pattern and begin to show you step-by-step my process on this piece. I’ve also been working on some other photo tutorials similar to the two-colored daisy stitch tutorials I posted last week, for variety in your flower stitching. I’ve got a couple books to review, but only one in the queue for this week. And of course, the odd tidbit that may pop up! Looking forward to the week, and I hope you are, too! Have a swell Monday! Your Tudor Rose is lovely, Mary. The cream & pink centre set off the deep reds & gold perfectly. Beautiful work!! Wow, it is a beauty Mary. This one looks lovely on its own but as part of the overall design they are going to look fantastic. I had some difficulty getting a nice join for the purl threads around the roundel on the Floral glove. It’s not an easy thing to do! I liked so much your rose that in the last weekend I’ve started mine too that is 2 inches wide and…yes this is an intense little project ! Small things are always more complicate but you achieved a great result! Absoloutely stunning, beautiful rose. its so tiny no wonder you struggled. I had to laugh when you said you lost your temper with the thread, how many times do I do that when the thread won’t do what you want it to do. I am embroidering a fiftieth wedding anniversary card for my sister and I am incorporating gold thread, I’ve never couched gold thread before so I am very nervous about it, I shall read all your articles on gold couching before I start including the one above. I think the colours are lovely. It’s very dramatic! It will look wonderful from afar. Perfect choices, I’d say. This is beautiful! It is delicate and perfect. I really don’t see anything wrong with the join. I can only hope that some day I can get to your level of expertise. I really love what you’ve done here. I like that you experiment and come up with your own designs and color choices, rather than follow an already established pattern. Mary, It’s absolutely gorgeous. Your embroidery skills are amazing and exquisite. Oh, Mary! It’s just lovely! I can’t wait to see the entire piece completed. Thanks very much for sharing your knowledge and projects with us. I have no one nearby who is interested in embroidery, so your daily posts are like 15 minutes spent with a stitching friend. Mary, your rose is so beautiful. Small design require a lot of attention, this one is perfect. This is so very pretty! Every time I look at this rose I keep scrutinizing to see the edge around the red. It looks very much like it has been outlined in the tiniest of black threads. You didn’t list black as one of your colors and when I look closely I think it must just be a n effect of the dark red and shadow or the shading I guess or could it be from the transfer pen? Whatever it is it is so pretty so would like to know how you made it look that way. This is still my favorite flower. The colorsof the silk and the gold play so nicely. I think this color scheme would also look very pretty on like a project that was a basket full of hanging flowers like fuscias and peonies. Oooh, with dark green leaves. Dark green leaves withe the mysterious dark black edging effect and thn mottled with gold and gold metal thread. Can you envision what my mind is creating? If I could do something like that, wow. I like how you have given us free patterns and I look at the designs a lot. I love those hanging flowers. Well now, thanks to your inspiration I think I know what I would like to try to do once I learn goldwork. Thank you Mary for showing and teaching us! Looking forward to watching this and all of your projects unfold! You make me laugh. This is one reason why I love how you teach sewing. I am so glad you let us know that stitching isn’t all quietly sitting, peaceful and zen-like. I’m grateful to know that there is some serious thread-wrangling that goes on. It is perfectly beautiful!!! Love it!!! The only word I can think of is exquisite, and even that word doesn’t do your rose justice. You are an inspiration! Thank you for sharing your journey on this FABULOUS rose! Once again the pursuit of excellence is so evident in your process. It’s encouraging and inspirational — and downright beautiful. It’s really lovely. I did wonder about the red on the outside, and I like your reasoning. The balance between the red and the gold is just right when looking at it from afar. I’m also glad to know that I’m not the only one that engages in those shouting matches with my threads. Only sometimes I do it out loud and my husband, son and cat (aka the guys I live with) all look at me strangely. All this beautiful eclesiastical work is really inspiring me to make a little something for my father who is a retired Episcopal priest. The church i grew up in has some of the most gorgeously hand embroidered vestments i have evwr seen. A full set with the 12 apostles on the chasuble with matching stole and altar cloth. I was so fascinated with them and other pieces i have seen in England and various museums and exhibits in the US. I have asked for several books from your rec ommended list to get me started. Thank you. I am not into doing gold work – yet, give me time, but this is an inspiration. 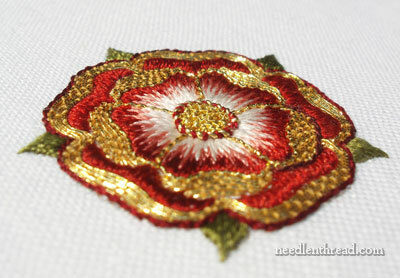 I love Tudor roses so it’s really a no-brainer. One of my least favourite colour combos ever is pink and yellow and let’s face it, gold is fancy yellow, so for my money the red was the only way to go on the outside unless you made it all white, which may have been all wight. I am really looking forward to the rest of this little saga. The rose is stunning. How you bring them to life with your stitching! MARY, iT IS VERY BEAUTIFUL!!!!!!! Stunning work, absolutely stunning. What an inspiration!